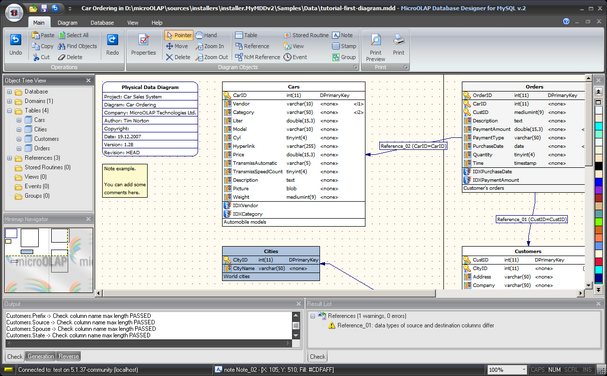 Database Designer for MySQL is a powerful solution for visual database development: creation, modification and reverse engineering. It greatly simplifies the process of database development and maintenance and makes it clear. By working with graphical representation of tables, columns, relations and other objects, you can build a database model that can be used to generate a physical database or to modify an existing one. The model can be automatically created from an existing database by reverse engineering. Database Designer for MySQL is specially developed for MySQL database and takes into account its features, has build-in support of tables, triggers, references, stored procedures and functions, views, events, indexes, foreign keys and other database objects. Database Designer for MySQL allows you to construct your database in easy-to-understand visual environment by working with graphical representation of tables, columns, relations and so on. Finally you will get Physical Entity Relationship Model (ER Model) that can be exported in SQL script or directly built on working MySQL database server. After modification of model you can synchronize existing MySQL database with it. The product allows to extract tables, attributes, relationships, indexes and other objects from existing databases including MySQL, Microsoft Access and Sybase ASE/ASA, Oracle, Informix, MSSQL, PostgreSQL, DB2, DBF and many others that accessible through OLEDB or ODBC. You can generate reports with complete information about a developed model in printer-friendly HTML view. To start using the product and find out more about it please refer to Creating Your First Diagram tutorial and short overview of Main Window Organization.